Direct mail services between London and Brighton started in 1810, and night mail coaches began in 1812. Mail and passenger stagecoaches were replaced by the railways, but the post office reintroduced horse-drawn coaches for the Brighton parcels traffic due to the high rates charged by railways. The Brighton coach was replaced by a motor van in 1905. The first Postmaster, between 1810 and April 1838, was James Swift, the post office at Crawley was then in the northern part of the White Hart Hotel. He was succeeded by William Mitchell, who built a house on the northern end of the White Hart where he received the post. Henry Gatcombe was appointed postmaster on Mitchell's retirement in November 1875, but he was replaced by Charles J. Mitchell, William Mitchell's son, soon afterwards on 27th January 1876 remaining until 4th August 1908. Due to the increase of work in 1883 the post office was transferred to larger premises on the corner of the High Street and New Road (later Post Office Road and then Robinson Road), and in 1895 a new post office was built in New Road. Crawley had been part of Horley's district, but they separated in 1907, and in 1928 the post office moved again to new premises in the High Street. On 9th February 1943 the post office was hit by a bomb from a German aircraft, demolishing part of the building. Mobile post offices were set up nearby and in the George Hotel car park for a few days before moving to the old St Francis School in Three Bridges Road. After six months another move was made to Grand Parade until the rebuilt High Street premises re-opened in October 1949. 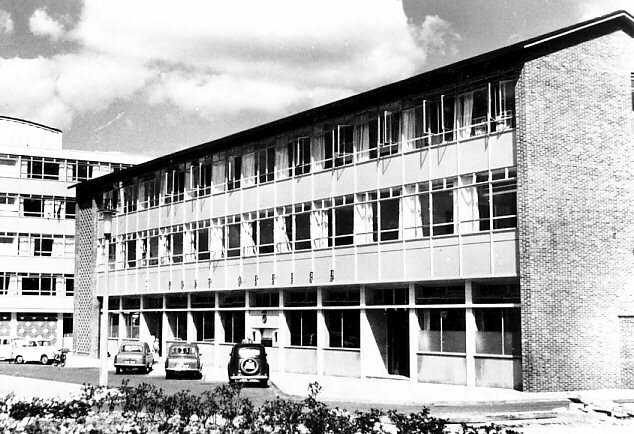 The current Head Post Office in the Boulevard was opened by Alf Pegler, vice-chairman of Crawley Council, on 18th February 1959, the first customer was Sir Thomas Bennett, chairman of Crawley Development Corporation. The public counter was closed in 2019 and re-sited within WH Smith, 23-24 County Mall.